There was a time when recording studios had to purchase multiple keyboards and pianos so they could have access to as many different sounds as possible. And by no means was this cheap. With technological advancements in Digital Audio Workstations (DAWs), VST plugins, and MIDI controllers, it has fast gotten to the point where the possibilities are near endless – you can play just about any sound you want with a single keyboard. The only limitation now is your computer. This does not mean that studios don’t continue to invest in expensive keyboard instruments, as they might produce a more “authentic” sound, but now anybody can write, compose, and record keyboard parts (and other instruments) from their home studio with an inexpensive MIDI controller. So, let’s look at some of the best units on the market. What Should I Look For In A MIDI Controller? Is A MIDI Controller The Same Thing As A Keyboard? What Sounds Can I Get With My MIDI Controller? Can I Use My MIDI Controller With Any Digital Audio Workstation? Where Can I Find Plugins? The M-Audio Keystation may not be the best USB MIDI controller on the market, but it’s low-cost at about $93, easy to use, and reliable. In addition to the 49-key version, it’s also available in 61-key and 88-key models, though these will cost you a little more. The semi-weighted keys may feel a little weird for piano payers, and could take some getting used to. You can also get synth-action keys, mind you. But overall, the Keystation offers all the basics – pitch bend and modulation wheels, octave range buttons, and transport controls. Typically, it also comes packaged with plugins and a DAW like Ableton Live Lite. Unless your needs are very specific or more sophisticated, this M-Audio unit should serve you well. The Novation Launchkey is available in 25, 49, and 61-key models. It’s built specifically for Ableton Live and for producing electronic music. Fortunately, it also works with other DAWs, but you might end up spending additional time in setup if you aren’t using Ableton. 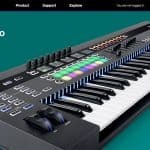 The Launchkey will cost you more than the M-Audio Keystation at $169.99 (for the 49-key version), but you also get more – 16-full color RGB backlit velocity sensitive drum pads, plenty of knobs and sliders, transport controls, pitch bend and modulation wheels, octave and transpose buttons, an LED display, and much more. 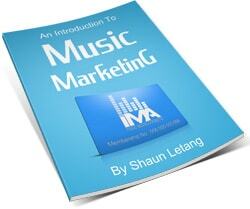 Not surprisingly, it comes bundled with Ableton Live Lite, virtual instruments, and samples. Have a look at the Novation – most customers seem satisfied with the unit. It’s good bang for buck. The Alesis V49 is another great option for beginners, or for those who aren’t looking for anything too fancy. At $129, it’s also cost-efficient. 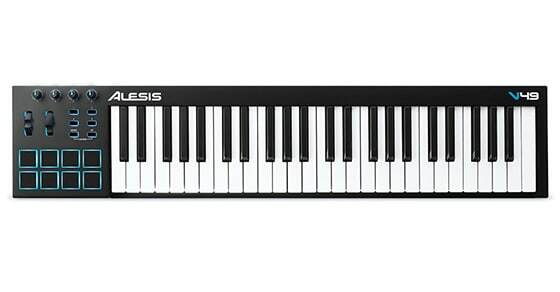 Like the Novation Launchkey, the Alesis is available in 25, 49, and 61-key models. You can adjust their sensitivity to tweak how you want your dynamics to come across. The V49 also comes with eight LED-backlist drum trigger pads responsive to velocity and pressure, four assignable knobs and buttons, as well as pitch and modulation wheels. Other than that, there isn’t necessarily anything special about the V49. It’s just a solid beginner MIDI controller. Now we’re going to look at a few advanced MIDI keyboard units. From the outset, you can see that the Akai Professional MPK249 looks like space-age technology compared to the previous entries. The 49-key version will cost you nearly $400, but you can also get the 25 or 61-key models. The semi-weighted keys are pressure sensitive. You also get: 16 RGB-illuminated MPC-style pads, eight control knobs, faders, and switches, as well as a backlit LCD screen. Akai produces solid, robust, quality products. 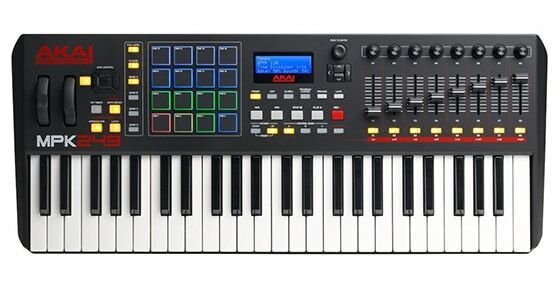 For producers that need to be able to pull off a lot on the fly, the MPK249 is worth a look. 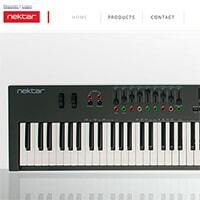 The Nektar Panorama is available in 49-key and 61-key models. They keys are weighted and velocity-sensitive. The 12 pads are velocity and pressure sensitive, and you also get 16 encoders, 10 assignable LED buttons, 20 preset locations, a motorized fader, and much more. At $499.99, you wouldn’t expect any less. This MIDI controller was originally marketed as a companion to the Reason DAW, but it works quite well with other DAWs too. From the knobs and faders to the buttons and the pads, this is a quality product. 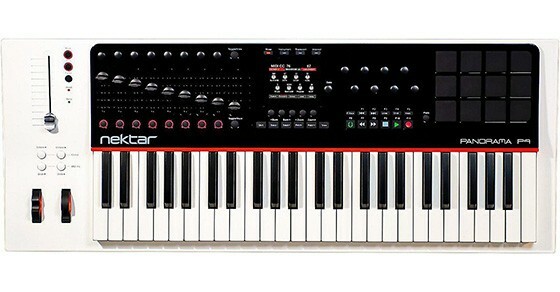 Check out the Nektar keyboard if you want something to compare against the Akai Professional MPK249. 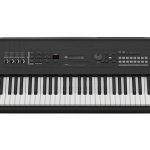 Native Instruments may be more known for their software than their keyboards, but the S-series holds considerable appeal. 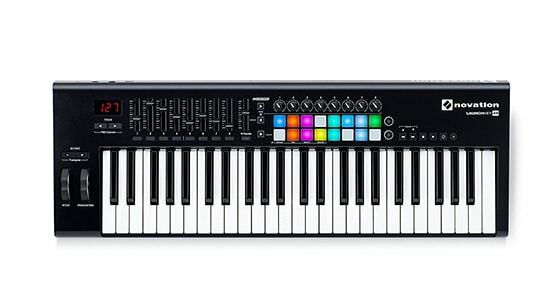 Komplete Kontrol is available in 25, 49, 61, and 88-key models. It offers Light Guide key illumination, Clear View display, touch strip controls, and much more. This is obviously a quality keyboard, and at $599, you would expect it to be. Some customers felt it was somewhat limited based on the price point, and others have found some issues with customer support, as well as software-hardware connectivity. Overall, however, it’s got a great feel, and it’s a robust MIDI controller. 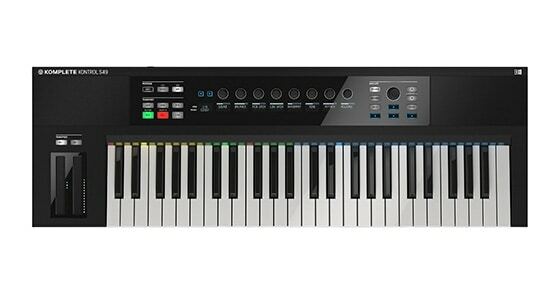 Have a look at this Native Instruments keyboard if you’re looking for a simple instrument with great feel. The A-500PRO is a “middle-of-the-road” option at $299.00. It has 49 velocity-sensitive keys, 45 assignable controls (knobs, sliders, buttons, transport, etc. ), and eight Dynamic Pads for finger drumming and MIDI triggering. It also comes bundled with Cakewalk Production Plus Pack (DAW and three virtual instruments). Customer reviews seem mixed, but that may be because some users weren’t sure how to take full advantage of this Roland unit. All positive reviews are 5/5 stars. For those who don’t want to pay an arm and a leg, but want a quality keyboard, this Roland might be a good fit. This depends. Do you want a MIDI controller that comes with all the latest bells and whistles (dials, sliders, function keys, pads, transport controls, touchpad, arpeggiator, display, motorized faders, etc. ), or do you need just the basics (such as a pitch and modulation wheel or octave buttons)? Are 25 keys enough, or do you need 88 keys? Should they be semi-weighted, weighted, or synth-action keys? 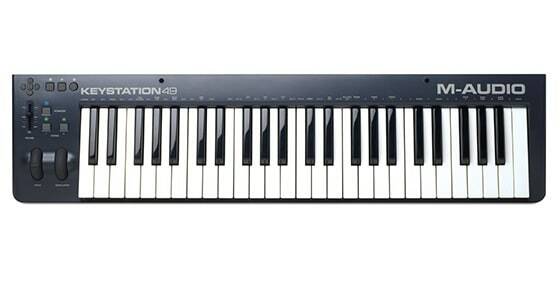 Or, in the case of an M-Audio Keystation, would you be okay with “weird” semi-weighted keys? Only you can answer these questions. If you aren’t sure, you should go to the store to discover the difference. As you can imagine, the more keys there are, and the more features you need, the more a MIDI keyboard is going to cost you. If you’re a beginner, you probably can’t go wrong with a 49-key MIDI controller with standard functions. These units are adequately flexible, and should be more than enough to satisfy your immediate needs. 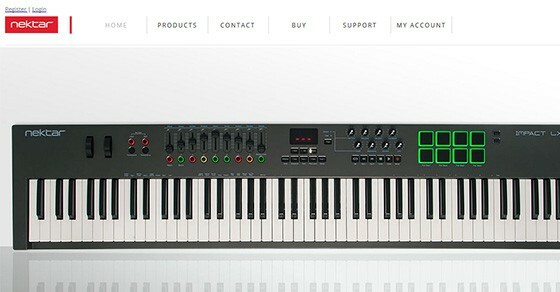 Also, see the M-Audio, Novation, and Alesis units from earlier. 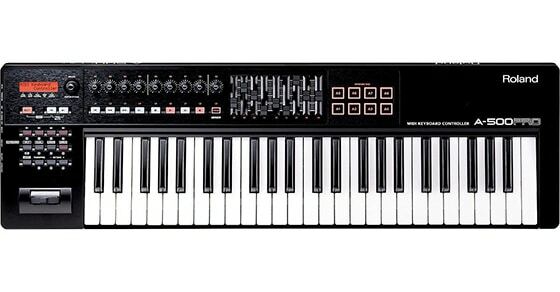 25-key units can also be handy for smaller studios, or if you just don’t have enough space to accommodate larger keyboard. But these are not ideal for piano or electric piano parts that require you to play separate parts at the same time with two hands (i.e. bass and melody). Smaller keyboards are great for desktop use, while you may need to purchase a stand for anything bigger than 49 keys. If you’re a full-fledged piano player, and you’ve either received training or taken lessons, then an 88-key fully-weighted MIDI controller might be more your style, and you might not be satisfied with anything less. I would even go so far as to say a digital piano might be a better option for you, as some can be used as MIDI controllers too. Digital pianos range in price from relatively inexpensive all the way up to pricey depending on the keyboard. No. As I said at the outset, many studios, engineers, and music producers still spend good money on pianos, electric pianos, organs, synths, and a variety of other keyboards, which offer a direct, authentic, high-quality sound. But you will also find a MIDI controller in just about every modern studio for additional flexibility. Most traditional keyboards have a built-in speaker. Some also have dials that affect your tone, or presets you can cycle through (like grand piano, trumpet, saxophone, bass synth, etc.). Most MIDI controllers do not have this. Most keyboards also run on DC power, while most MIDI controllers are USB-powered. This doesn’t mean that you can’t use a MIDI controller in a live setting. But it still needs a “brain” to operate, usually a desktop or laptop computer. This is no different in a studio situation. You would also need to bring a separate amp to put your sounds through, or use a DI box to go directly into the board. The sounds a traditional keyboard produces is limited by the presets that are built into it, as well as the faders, knobs, or buttons that affect the tone. A MIDI controller can quickly transform into any instrument, and is only limited by what virtual instruments you’re using it with. It’s important to be aware of these differences in case what you want is really a digital piano or traditional keyboard instead. 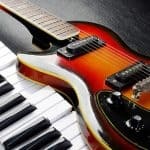 A MIDI controller is a great production tool, and can also be great in a live situation (assuming your computer doesn’t crash), but it may not be exactly what you’re looking for if you thought it was the same thing as a keyboard. Pianos, electric pianos, organs, synthesizers, bass synthesizers, orchestral instruments (violin, cello, flute, etc. ), drums, and the list goes on. The only real limitation is the software available to you. But you should know that most MIDI controllers are production tools, and do not produce any sound on their own. You must connect the keyboard to your computer (usually via USB), set up your DAW, and assign a virtual instrument to the track your MIDI controller is assigned to. If you aren’t used to using DAW software, you’ll want to take some time to study up. In addition, your DAW may have a few built-in plugins, but it’s unlikely they’ve included all the sounds you’ll potentially want to use with your MIDI keyboard. You’ll either want to purchase or download additional plugins for all the sounds you need. In general, yes. Some MIDI controllers may work better with certain interfaces over others, but unless the production software is particularly powerful and well-laid-out, this won’t make much of a difference. Before purchasing a MIDI controller for yourself, be sure to check with the manufacturer website to find out what DAWs they support. If you can’t seem to find an answer on their website, then reach out to customer support, or inquire at your local music instrument dealer to find out. You’ll find that many MIDI keyboards come with a suite of software that can be installed on your computer – this might include a DAW, virtual instrument plugins, and a host of samples. But don’t expect to get everything in one place – there wouldn’t be a market for plugins if MIDI controller manufacturers gave everything away for free. Fortunately, there are sites like Splice, VST 4 FREE, VSTPLANET, and VST Warehouse where you can download VST, AAX, and AU plugins entirely for free. You’ll also find plenty of top 10 lists of free plugins on Google if you go looking for them. Not all free plugins are high quality, however. There are also many audio companies that specialize in virtual instruments, like Native Instruments, Arturia, Spectrasonics, Steinberg, ToonTrack, IK Multimedia, Celemony, SONiVOX, and so on. These companies create quality products, but at times you will pay a pretty penny for them. 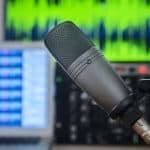 It could be said that your MIDI controller is about as good as the plugins you use with it, so at some point you may need to fork out the cash for better quality sounds. Most if not all manufacturers or brands mentioned in this guide produce both entry-level to professional grade MIDI controllers. So, if you happen to like M-Audio, for instance, and you’d like to check out a product with more features than the Keystation, you might have a look at something like the CTRL49. The right MIDI controller ultimately depends on the individual’s preferences. Some people might like the way the keys feel on certain keyboard controllers. Others might like the way the pads and dials are laid out. Different people use MIDI controllers in different ways. First and foremost, you should look for a controller that suits you and your needs.